During his nearly two full seasons playing for the Penguins the 6-5 starting guard has averaged over 7 ppg and 2 rpg plus 1.5 apg while starting about 1/3 of the team’s games. He’s also been very effective coming off the bench, including one game where he scored 19 points. The UIC Pavilion was rocking before the game as the Flames held a special event dubbed as “Leopard Seal Night”, recognizing the leopard seal as the main predator of Penguins in Antarctica. So the large crowd was revved up by a series of pregame events that focused on the demise of Penguins. Youngstown State began the game as if they were offended by the pre-game antics. The team applied a staunch defense and leapt out to an 22-11 lead after 6-1/2 minutes of play. UIC came back to score the next 9 points and drew within 2. C Will O’Neil, who had been getting a breather on the bench returned and devastated the Flames’ defense. But SG Ronald Spruel scored well for UIC to keep them in the game. The half ended with the Penguins holding a 42-36 lead. YSU outrebounded UIC 25-12 and hit 50% of their shots compared to 36% shooting by the Flames. But UIC hit 5 three’s compared to none by the Penguins. O’Neil scored 20 and yanked down 8 rebounds and SG/SF James Asbury scored 5 and had 3 assists and 7 rebounds for Youngstown State while Spruel hit for 13 and SF Thurman Coursey scored 12 for UIC. The Penguins led in the 2nd half until UIC hit a bucket and then made two quick backcourt steals, scoring on both to tie the game at 68-68 with 8 minutes to go. Following the media time out, scored 8 quick unanswered points. The Penguins made a few runs cutting the lead in half, but each time the refs called repeated fouls against YSU that allowed the Flames to regain their footing. With the UIC student body collectively dispaying the choke gesture toward the Penguins, the game ended with Youngstown State on the short end of a 93-84 score. UIC hit 11 of 26 three’s and scored 14 more points at the free throw line than did the Penguins. C Will O’Neil scored 22 and had 9 rebounds, PG Pat White popped in 19 points and dished out 7 assists, and SG/SF James Asbury finished with 10 points, 5 assists, 9 rebounds, 3 steals and a block. The Flames SG Lonnie Sinville had 21 points and 5 steals, SF Thurman Coursey notched 20 points, and SG Ronald Spruel hit for 19 and those 3 players hit 9 of 19 three-point shots. It’s rumored that the loss brought out some ugliness within the team with LeRoy Delea complaining about Andre Lilly being unfairly favored. The coaching staff refused to comment saying they wouldn’t discuss internal team matters. Youngstown State jumped out to a 12-2 lead but visiting Milwaukee struck back to go ahead 15-14. The lead then shifted back and forth, but in the final 8 minutes of the first half, the Penguins gradually pulled away. When the buzzer sounded, YSU was on top 45-30 by outshooting the Panthers 56% to 32%. PF/C Andre Lilly and C Will O’Neil both scored 10 points. The Penguins continued to roll in the 2nd half and stomped the Panthers 88-58 with the entire bench getting playing time. YSU held hit 52% of their shots whereas Milwaukee scored on just 34% of the field goal attempts. The Penguins held a 20-11 turnover advantage and out-rebounded the Panthers 39-33. C Will O’Neil hit for 18 points while grabbing 9 rebounds and getting 4 steals and 3 blocks. PF/C Andre Lilly also scored 18 and SG Noel Manley added 12. SG Kyle Selby, who scored 26 points, was Milwaukee’s lone bright spot. The 18-7 (11-5) Penguins remains in 2nd place in the Horizon League, following Detroit by 1 game. YSU’s RPI is 43rd best in the country. Walk-on PG Blake Elleby strained his abdominal muscle and is expected to be on the injury list for 2 weeks. But the Penguins announced that PF Donnie Williams broken toe has healed and he will be ready to play in their next game. Knowing that Detroit lost earlier in the day meant that Youngstown State could tie for the lead if only they could win a road game against Wisconsin-Green Bay. After falling behind 4-0, the Penguins went on a 13-0 run, but C Will O’Neil picked up his 2nd personal foul just 3-1/2 minutes into the game. PG Pat White joined O’Neil on the bench with 2 fouls at the 15:41 mark. After 5 minutes of play the Penguins already had been charged with 7 team fouls while none had been called on the Phoenix. With 11:40 remaining in the first half, Wisconsin-Green Bay recaptured the lead 16-15. With 2-1/2 minutes to go in the half, the Phoenix were called for their first foul! But someway the Penguins came out of the half with a slim 34-32 lead. That was primarily due to SG/SF James Asbury’s scoring early in the half and C Will O’Neil’s scoring late in the half. Both had 10 points at the break. C Jamil Weekes scored 13 to lead Wisconsin-Green Bay. The Penguins controlled the game in the early going of the 2nd half. But with 13 minutes to play and YSU ahead 51-42, C Will O’Neil picked up his 4th foul. As the refs continued calling fouls against the Penguins and not the Phoenix and with the game score tightening, Coach Durst had an outburst that resulted in a technical. The Penguins gamely held onto a slim lead. With 4 minutes remaining YSU was ahead 69-65. O’Neil, Lilly and White expanded the Penguins lead to 75-67 but at that point O’Neil fouled out. The Phoenix began intentionally fouling, but YSU could not connect on a free throw. With 39 seconds remaining Wisconsin-Green Bay sunk a 3 to cut the lead to 77-75. Lilly was fouled with 28 seconds to go. He hit the first but missed the second and the Phoenix, now trailing by 3, rebounded and called time out with 26 seconds to go. The Phoenix beat the Penguins full court press, but before they could get their play set up, Pat White stepped in front of a pass and stole the ball. He quickly pushed the ball upcourt to a flying Colin Chambliss who slammed down a dunk to put YSU ahead by 5 points with 13 seconds left. Wisconsin-Green Bay got off a 3 point attempt but it went off the rim and out of bounds. The Penguins ran out the clock and won the tight game 80-75. Although the Phoenix scored 12 more points at the line, the Penguins hit 52% to Wisconsin-Green Bay’s 42%. Even though limited to just 21 minutes of court time, C Will O’Neil scored 16 as did PG Pat White who also had 11 assists. SG Matt Angner tossed in 14, C/PF Andre Lilly scored 11, and SG/SF James Asbury added 10. C Jamil Weekes led Wisconsin-Green Bay’s scoring with 21. Going into the final game of the regular season, the Penguins are now tied with Detroit for 1st place in the Horizon League with 12-5 records. Youngstown State’s season record is 19-7 while Detroit’s is 17-9. In the Penguins final league game, they didn’t score against visiting Valparaiso for the first 3 minutes of the game. The Penguins defense stymied the Crusaders for most of the first half and YSU was able to build a 37-24 lead at the break. Even though Valparaiso hit some late shots in the half, they still connected on just 33% of their field goals attempts. With C Will O’Neil again getting into early foul trouble, PG Pat White and C/PF Morris Phelan led Youngstown State’s scoring with 8 points apiece. After 5 minutes of play in the 2nd half, YSU led by 21. The lead ballooned to 25 points before the Penguins coasted to an easy 68-52 victory. YSU out-rebounded the Crusaders 47-28. Surprisingly, Detroit lost at home so the win by the Penguins boosted them into sole possession of 1st place in the Horizon League. Youngstown State finished the regular season with an overall 20-7 record and were 13-5 in the Horizon League. Their RPI is now 34th best in the nation. The team has averaged 82.4 ppg while giving up 73.4 ppg. They will ride a 3-game win streak into the Horizon League Tournament. C/PF Morris Phelan scored 13 and grabbed 7 rebounds. PG Pat White hit for 12 points and SG/SF James Asbury dropped in 11 points. 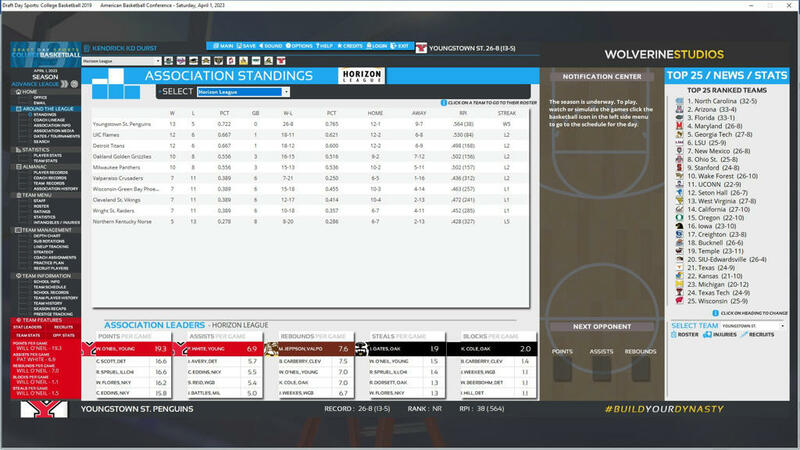 On the final day of Horizon League play, the Youngstown State Penguins edged ahead of all competitors to take the Horizon League crown. This is the fifth straight season that the Penguins have finished atop the Horizon League. Last night the Horizon League Tournament kicked off with two play-in games matching up the bottom four teams in the league standings. Wisconsin-Green Bay (led by Josh Abraham’s big scoring effort) won in overtime while Cleveland State (with a typical stellar effort by Michael Schau) won with relative ease to move on to take on the two top teams in the league in the 2nd round. Even though UIC, the league’s hottest team at the end of the season, got a tremendous performance from Thurman Coursey, Wisconsin-Green Bay led from start to finish and won going-away. For the Phoenix Josh Abraham came up with another strong game but had good support from C Jamil Weekes and PF Julian Bonner who both scored 15. In the second game of the day, the slumping Detroit Titans were nearly defeated by lowly Valparaiso. Detroit was led offensively by Thurman Coursey with PG Jim Avery dishing out 10 assists. Valparaiso was carried by a double-double performance by freshman Marty Jeppson. With Gary Johnson ablaze Oakland stormed away from Milwaukee in the first half and then went on cruise-control throughout the 2nd half and still won with ease in a game that was expected to be a toss-up. Even though the refs calls against Youngstown State sent 3 starters to the bench early in the 2nd half, their offense was cooking so that by mid-way through the first half they had a double-digit lead. The Penguins hot-shooting (55%) and 7-1 turnover advantage kept them well-ahead as they finished the first half on top 48-34. Youngstown State never let the Vikings get close in the 2nd half and won in workmanlike fashion. Although fouls limited his playing time, C Will O’Neil still was the Penguins leading scorer with SG Noel Manley and SG/SF James Asbury each adding 12 points. Cleveland State had 5 players score in double figures, but it wasn’t enough. The Penguins held the usually high-scoring Michael Schau scoreless. In a game with 23 lead changes and 8 ties, Detroit and Wisconsin-Green Bay were forced to go to overtime. The Phoenix outscored the Titans and came away with an upset victory, again led by Copley Scott. Jamil Weekes was top scorer for the Titans but PF Julian Bonner had a double-double with 10 points and 11 boards. Youngstown State pulled away early in the first half and led by 12 midway through the half. But the Penguins’ shooting cooled and Oakland’s 3 point shooting caught fire along with the refs sending the Golden Grizzlies to the line so that they roared back to take a late 3 point lead. PG Pat White hit a last second 3 for the Penguins to tie the game at 43-43 at the break. White and C Will O’Neil both scored 11 for YSU while PG Gary Johnson and SG Clint Smith both had 10 points for Oakland. Oakland went on a 12-2 run to begin the second half. The Penguins fought back to cut the Golden Grizzlies’ lead to 2. But YSU’s shooting went south allowing Oakland to pull away again. Youngstown State was unable to recover and fell by a final score of 82-72. Oakland scored 17 more points at the free throw line than did YSU. PG Pat White led the Penguins scoring with 21 points while C Will O’Neil finished with 15. PG Gary Johnson topped Oakland’s scoring with 17 points.